Synopsis: When an oil spill off the coast of Capetown jeopardized one of the largest colonies of endangered South African penguins, we were called upon to shoot the rescue efforts. 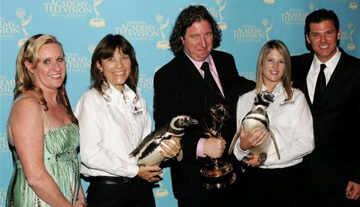 I was honored to be on location to witness the efforts of people worldwide, including the South Africans who volunteered tirelessly, honored to be able to tell this incredible story, and honored to receive an Emmy.To date, it is still the most successful bird rescue in history. Copyright 2016 TinWoman Productions, Inc. All rights reserved.